True confession time: I’m an incurable rummager. I’ve never met an antique/junk/used stuff store in which I couldn’t happily pass an hour or two. Lately, in the course of building and decorating a new wine cellar, I’ve been on the prowl for wine memorabilia. And in a little hole-in-the-wall in La Conner, I struck gold. Carefully shrink-wrapped, and complete with a couple of ancient grease stains, was the wine list from Ben’s Fog-Horn Diner, a long-forgotten roadhouse on the Old Tacoma Highway south of Seattle. A three color charcoal sketch on the cover shows a bottle of Guasti Burgundy and a pair of martini glasses filled to the brim with cherry red wine. Inside are listings of wines-by-the-glass, light entrees, and a wonderful “Guide To The Selection of Wines” that clearly shows that the challenges of matching food and wine are nothing new. 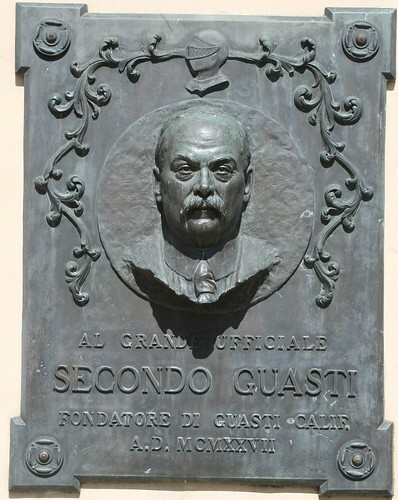 Guasti was a Cucamonga Valley winery founded around 1900 by an immigrant from the Piedmont, Secondo Guasti. It spawned a sprawling wine industry in the valley, survived Prohibition, and became part of the giant Fruit Industries conglomerate after the Repeal. Judging from the wines listed on the menu, and the prices being asked, the Fog-Horn list must be at least 60 years old. What does it have to tell us? This was the hey-day of sweet, fortified dessert wines, and the Guasti line-up includes Port, Sherry, Muscatel, Tokay, Madeira and Sauterne, all, presumably, from California grapes. Claret and Burgundy are also offered, along with Angelica and Ambassador (a “carbonated wine”). They were all sold by the glass, for 15 cents. It’s interesting to note that the sandwich menu (Ben’s was apparently a favorite for lunch) lists Southern baked ham, lettuce and tomato, and goose liver sausage sandwiches all for 15 cents, so the glass of wine was as expensive as the entrée, a practice which continues to this day. The menu goes on to list specific courses with specific wine suggestions. Apart from the endless variations on imitation European wines (Chablis, Hock, Moselle, Burgundy et al), there is at least one recognizable old friend on the list, sturdy Zinfandel. The most intriguing match-ups follow the “Dessert” category, which lists Port, Muscatel, Dolly Madison and something labeled Chateau Y Quem among the choices. Could Ben’s have slipped in something legit among all the poseur wines? I have been unable to find any specific references to a California-made Chateau Y Quem, but perhaps an alert reader can fill me in. All in all, the wine list from Ben’s surprised me with its breadth, its genuine commitment to including wine as an essential part of a quality dining experience, and its carefree appropriation of classic European appellations. It speaks to a different era, when domestic wine was in transition from being “forbidden fruit” but had not yet made the leap to establishing its own clear identity. It shows how much progress we have made in a half century or so — how sophisticated we have become. But it also shows a kind of innocence lost. Don’t get me wrong. I’m not suggesting that we pine for the good old days, when the ‘white wine with fish, red with meat’ rule ruled; when winemakers carelessly appropriated classic European names like Sauterne and Chablis; and when sweet wines dominated the American palate. But there are some things they got right back then. For example, the patrons of Ben’s Fog-Horn didn’t lose any sleep worrying about great vs. not-so-great vintages. They drank what was available, and if vintage variation was in evidence, it wasn’t good or bad, just different. There were no pricey cult wines with 90+ scores to hunt down; the very idea of scoring wines hadn’t entered the consumer consciousness. What mattered was what you liked, not what some reviewer liked. The point was, have a glass of wine with your goose liver sandwich, and whether you chose the Angelica or the Zinfandel, or anything in between, enjoy! In the same spirit, it’s worth taking a moment to examine your own wine-buying habits. Are you too concerned with getting only the wines that have the right score, the right vintage, the right label? Would you ever order an unknown wine from an unfamiliar producer when sitting down for a meal? How important is knowing the score of a wine to your own appreciation of its worth? There’s no question that consumers are more knowledgeable, more sophisticated than ever. And when you are faced with a wine menu and the sommelier is on his way to the table, you are certainly better off knowing a thing or two about the ways in which wine and food complement each other. But in order to fully participate in the ongoing adventure of wine, a little old-fashioned grace and inclusiveness is a good thing too. It will open the doors to new experiences, new flavors. Let’s not ever get too sophisticated for that. Fascinating . . . and you did a great job making it timely! Whenever I go to a new tasting room, I always make sure I taste the wine I think I'm not going to like! There are so many nice wines and our perceptions are easily tainted by a bad experience with a type of wine from one producer, we can often be pleasantly surprised by the wine from another producer.